Lewis's mother dies in childbirth 1872. His father is apparently deceased by this time also. Lewis and his siblings are sent to homes of different family members. Claude Atherton Luttrell, Sr. (grandson of J. M.) diary notes show "James Monroe". Article about William T. Luttrell in "Portrait and Biographical Album of Morgan and Scott Counties, Illinois" by Chapman Brothers, 1889 also shows "James Monroe". **Mamie not shown in other sources. "Mamie" (spelling questionable) shown in diary entry of Claude Atherton Luttrell, Sr. with notation "adopted (child) by Smith". In notebook of Claude A. Luttrell, Jr., reference is made to a “letter from Aunt Mary (dau. of L. P. Luttrell) of July 21, 1953. . .
Lewis Luttrell listed in household of George M. and Catherine Wright. 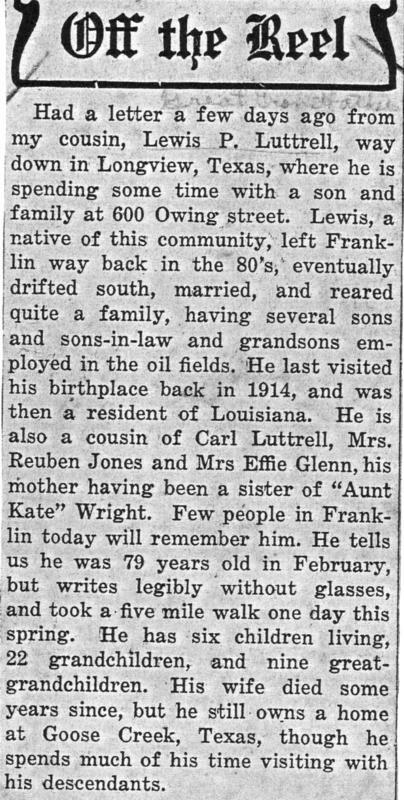 Listed as "laborer" and "farmer"
According to Franklin, Illinois newspaper article, "Off the Reel" (abt. 1941), "Kate" Wright is Lewis Palmer's mother's sister. Mrs. Effie Glenn, Mrs. Reuben Jones and Carl Luttrell are his cousins. He left Franklin in the 80's and drifted south. He has a son at 600 Owing Street, Longview, Texas, "six children living, 22 grandchildren and 9 great-grandchildren". "He owns a home at Goose Creek, Texas; he "writes legibly without glasses", and "took a five mile walk one day this spring" (he celebrated birthday #79 the previous February). According to Laura Estelle Hammett Luttrell (Mrs. Claude A Luttrell, Sr), L. P. and Kate "separated in 1905. L. P. stayed at Karnack, TX. Kate and children went to Alden Bridge, LA. L. P. sent Elmer (age 16) to Navy to keep him from helping Kate, hoping Kate would come back". In notes by Claude A. Luttrell, Sr, "Dad lived with Bud at Gilliam, went to Chester, 1919, then to Goose Creek (TX) in 1924, married Ann Chelette". ​1880 census for Bossier Parish, LA shows Nancy, Kate and Alonzo, age 6 in home of Hugh M. Underwood. "Kate & L. P. separated in 1905. Kate went to Grandma's in Alden Bridge, LA; married 'Dad Wood' in 1911 or 1912"
H. M. Underwood (Uncle Marshall Underwood?) was Witness on Kate and Lewis's wedding license. Kate and Lewis "separated in 1905". Kate married "Dad Wood in 1911 or 1912 at Oil City (LA)"
Momma Ann’s mother was Louisa Katherine Brown, oldest child of George and Nancy Ann Brown; born 24 October 1866 in Birmingham AL. Kate was only eight years old when her father died and they went to live in Uncle Hugh’s (Underwood) big house. She married, second, Mr. B. F. Wood and at her death, 18 Jan 1928, was buried at Mooringsport (Caddo Parish), LA with a tombstone which reads simply “Mrs. Wood”. George Brown married Nancy Ann Underwood, sister of Hugh M Underwood. The earliest record available for them is the birth of their daughter Louisa Katherine in 1866. George died about 1874; about the year Alonzo was born to Nancy in Louisiana. Nancy died in 1905 at age 66. 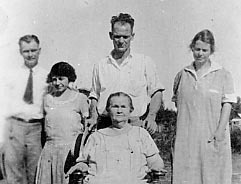 Kate Luttrell, front, with son, Claude A. Luttrell, Sr. (behind her) and possibly other children. Possibly Joe Bailey on left, ? next to him and Mary on right.